Taputapuātea, an ancient marae constructed of stone on Ra'iātea in the Society Islands, restored in 1994. A marae (in New Zealand Māori, Cook Islands Māori, Tahitian) malaʻe (in Tongan), malae (in Samoan) and mālaʻe (in Hawaiian) is a communal or sacred place that serves religious and social purposes in Polynesian societies. In all these languages, the word also means "cleared, free of weeds, trees, etc." It generally consists of an area of cleared land roughly rectangular (the marae itself), bordered with stones or wooden posts (called au in Tahitian and Cook Islands Māori) perhaps with terraces (paepae) which were traditionally used for ceremonial purposes; and in some cases, a central stone ahu or a'u. In the Rapanui culture of Easter Island "ahu" has become a synonym for the whole marae complex). In some modern Polynesian societies, notably that of the Māori of New Zealand, the marae is still a vital part of everyday life. However, in tropical Polynesia, most marae were destroyed or abandoned with the arrival of Christianity in the 19th century and some of them have become an attraction for tourists or archaeologists. Nevertheless, the place where the marae were built are still considered as tapu in most islands. In the Cook Islands, a few marae (Arai-te-Tonga, Vaerota, Taputapuātea) are still maintained, and are quickly tidied up before the investiture of a new ariki. The word has been reconstructed by linguists to Eastern Oceanic *malaqe with the meaning "open, cleared space used as meeting-place or ceremonial place". 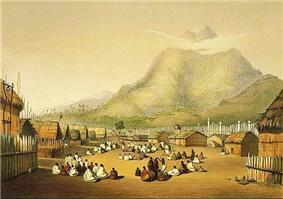 A marae at Kaitotehe, near Taupiri mountain, Waikato district, 1844. It was associated with Pōtatau Te Wherowhero, a chief who became the first Māori king. In Māori society, the marae is a place where the culture can be celebrated, where the Māori language can be spoken, where intertribal obligations can be met, where customs can be explored and debated, where family occasions such as birthdays can be held, and where important ceremonies, such as welcoming visitors or farewelling the dead (tangihanga), can be performed. Like the related institutions of old Polynesia, the marae is a wāhi tapu, a 'sacred place' which carries great cultural meaning. In Māori usage, the marae atea (often shortened to marae) is the open space in front of the wharenui or meeting house (literally "large building"). However, the term marae is generally used to refer to the whole complex, including the buildings and the open space. This area is used for pōwhiri – welcome ceremonies featuring oratory. Some marae do not allow women to perform oratory there. The meeting house is the locale for important meetings, sleepovers, and craft and other cultural activities. The wharekai (dining hall) is used primarily for communal meals, but other activities may be carried out there. Many of the words associated with marae in tropical Polynesia are retained in the Māori context. For example, the word paepae refers to the bench where the speakers sit; this means it retains its sacred and ceremonial associations. Marae occur in various sizes, with some wharenui being a bit bigger than a double garage and some being larger than a town hall. a list of the beneficiaries: usually iwi (tribes/nations), hapū (clans) or whānau (families); in some cases, the marae is dedicated to the common good of the people of New Zealand. procedures for amending the charter, and for ensuring adherence to its principles. The New Zealand Māori Arts and Crafts Institute Act, 1963 was passed and the institute built to maintain the tradition of Whakairo. The NZMACI is responsible for the restoration and building of over 40 marae around New Zealand. Like in pre-European times, marae continue to be the location of many ceremonial events, including birthdays, weddings, and anniversaries. The most important event located at marae is the tangihanga. Tangihanga are the means by which the dead are farewelled and the surviving family members supported in Māori society. As indicated by Ka'ai and Higgins, "the importance of the tangihanga and its central place in marae custom is reflected in the fact that it takes precedence over any other gathering on the marae" (p. 90). Most iwi, hapū, and even many small settlements have their own marae. An example of such a small settlement with its own marae is at Hongoeka Bay, Plimmerton, the home of renowned writer Patricia Grace. Since the second half of the 20th century, Māori in urban areas have been establishing intertribal marae such as Maraeroa in eastern Porirua. For many Māori, the marae is just as important to them as their own homes. Some New Zealand churches also operate marae of their own, in which all of the functions of a traditional marae are carried out. Churches operating marae include the Anglican, Presbyterian, and Catholic churches. In recent years, it has become common for educational institutions, including primary and secondary schools, technical colleges, and universities, to build marae for the use of the students and for the teaching of Māori culture. 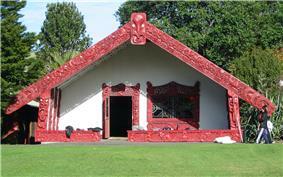 These marae may also serve as a venue for the performance of official ceremonies relating to the school. The marae of the University of Auckland, for instance, is used for graduation ceremonies of the Māori Department, as well as welcoming ceremonies for new staff of the University as a whole. Its primary function is to serve as a venue for the teaching of whaikōrero (oratory), Māori language and culture, and important ceremonies for distinguished guests of the University. Two spectacular secondary school marae are located in the Waikato at Te Awamutu College and Fairfield College. The latter was designed by a Māori architect with a detailed knowledge of carving and weaving. The wharenui features an intricately carved revolving pou as well as many other striking features. In addition to school activities it is used for other weddings. In the remote southeastern corner of the Polynesian Triangle elements of the traditional Polynesian marae evolved into the Rapa Nui/Easter Island Ahu and their iconic Moai (giant forms of Polynesian statues). In Tahiti, marae were dedicated to specific deities, and also connected with specific lineages said to have built them. During the 1994 restoration of Taputapuātea marae at Ra'iātea island by archaeologists from the Tahiti Museum, human bones were discovered under some of the structures. It is possible they were the remains of sacrifices to the Polynesian god ʻOro, revered in Tahiti. ^ Rarotongan tradition holds that Taputapuātea marae at Rarotonga, which archaeologists have dated to the 13th century, was built by Tangi'ia who brought the central stone with him from the ancient marae of the same name at Ra'iātea. Indeed, it seems that it was quite usual in ancient times to take a stone from this marae. The son of Tetupaia and Teu had not only the right to a seat in the great Marae of Taputapuatea in Raiatea, but he could take his stone from Taputapuatea and set it up in his own district of Pare Arue (Tahiti), so founding a Marae Taputapuatea of his own to wear the Maro-'ura (red waist girdle of the ariki)in. Ta'aroa Marau, "Memoirs of Arii Tamai e marama of Eimo Teriirere of Tooarai Terinui of Tahiti Tauraatua i Amo"
^ Ka'ai, T. M., & Higgins, R. (2004). Te ao Māori – Māori world-view. T. M. Ka'ai, J. C. Moorfield, M. P. J. Reilly, & S. Mosely (Eds. ), Ki te whaiao: An introduction to Māori culture and society (pp. 13–25). Auckland. New Zealand: Pearson Education.